A total of 1,250 academics from more than 100 organizations across 37 countries of the world have signed a petition asking for the release of 15 Boğaziçi University students in Turkey who were detained in March for holding a protest against an ongoing Turkish military offensive in the Afrin region of Syria. 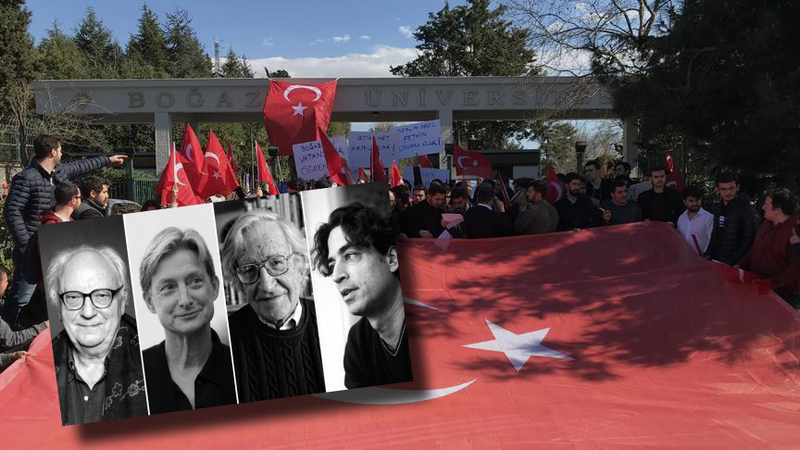 The letter, penned by the Academic Solidarity Network, asks the Turkish government for the immediate release of the students, saying the arrests on campus as well as subsequent police raids of student homes and dormitories continue a disturbing trend of criminalizing political speech and dissent in Turkey. Among the signatories of the letter are distinguished figures such as Angela Y. Davis, Judith Butler, Noam Chomsky, Alice Crary, Nancy Fraser, Marianne Hirsch, Michael Hardt, Etienne Balibar, Mary Marshall Clark, Seyla Benhabib, Jay M. Bernstein, Partha Chatterjee, Bertell Ollman, Susan Buck-Morss, Pulitzer Prize winning Junot Diaz, Homi K. Bhabha, David Graeber, Todd Gitlin, Immanuel Ness, Eduard Brezin, Nobel Prize winning Eric Wieschaus and Jack W. Szostak. The letter has been sent to Turkish President Recep Tayyip Erdoğan, Turkish government officials, UN and EU officials, the Turkish Embassy in Washington, D.C., and the consulate general in New York as well as to the rector of Boğaziçi University. “President Recep Tayyip Erdoğan has cynically referred to these students as “terrorists”, vowed to expel them from Boğaziçi University, and to deny them the right to study at any other university. We have heard this kind of verbal attack from Erdoğan before and it was followed by the detention of thousands of academics, journalists, artists, and human rights advocates. This article originally appeared in Turkish Minute on Apr 2.